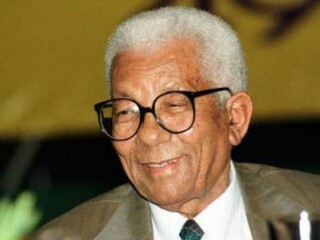 Walter Sisulu, also known as: Walter Max Ulyate Sisulu born May 18, 1912 in Qutubeni, Transkei, South Africa - died May 5, 2003 in Orlando West, South Africa is a Sourh African civil rights activist. Walter Sisulu was one of South Africa's most important leaders in its decades-long struggle to end apartheid. A key figure in the African National Congress (ANC) of the 1940s, it was he who brought future South African president Nelson Mandela into the organization. Both Sisulu and Mandela were later imprisoned for 25 years by the South African government for their political activities. Sisulu was released from jail in 1989, at the age of 77, and continued to play a vital role in shaping South Africa's emergence as a free, democratic nation until his death in 2003. Sisulu was born on May 18, 1912, in a village called Qutubeni in the Transkei reserve. His mother was a Xhosa, one of the major tribes of South Africa, while his father was a local magistrate and of European background. The relationship between his parents, who never married, also produced a younger sister, Rosabella, but neither she nor Sisulu knew their father's name until much later in life. Such unions between blacks and whites were generally taboo at the time, though not technically illegal, as they would later be declared. Sisulu was raised by his uncle, a respected Xhosa chief and village council leader, whose leadership style was likely a tremendous influence on him. He attended a local village school and then a mission school run by the Anglican church. His family had a bit of land to farm and a small herd of cattle, and Sisulu looked after both as a boy. When his uncle died, Sisulu dropped out of school to find a job, for it fell to him to support his family. In 1928, the year he turned 16, he boarded a train for the first time in his life and went to look for work in Johannesburg, South Africa's main city, some 600 miles from his home. For many years Sisulu worked menial jobs, the only kind available to blacks without a university education. He delivered milk by horse-drawn cart, working twelve hours a day, seven days a week for the monthly salary of one pound. Early on, he realized the importance of speaking English fluently if he was to survive in the European-dominated cities. He remained close to his Xhosa roots, however, traveling back to Qutubeni for his tribal initiation ceremony and later writing articles about Xhosa history for a black journal. Settled in Johannesburg permanently by the mid-1930s, Sisulu brought his mother and sister to live with him, and together they bought a small red brick home in a district called Orlando West. It later became part of Soweto, the acronym given to the southwest townships of Johnannesburg, where blacks had been allowed to settle. Sisulu worked in a factory and a bakery, and also in South Africa's famous gold mines, before taking night-school courses to become a real-estate agent. His office helped blacks buy and sell property in Johannesburg, though such freedoms later ended. Sisulu formally joined the African National Congress (ANC) in 1940. The political party had been founded the year he was born, in 1912, as the South African Native National Congress, in part to protest the 1913 Land Act that forced blacks into designated homelands that were for the most part unsuitable for farming. The Land Act forced them to earn a living by working on white-owned farms, or in factories or mines, and bred the seeds of a deep discontent in the country. The ANC was a weak organization at the time Sisulu joined. Its strongest actions were to present formal petitions to the white government. Sisulu came to believe that the organization needed new blood and a new direction. He found someone who shared his ideas when a young student came into his downtown Johannesburg office one day seeking a job recommendation. Nelson Mandela, eight years younger than Sisulu, had just been fired from a mining job. He hoped to find work for a lawyer in the city, and eventually to become a lawyer himself. Like Sisulu, Mandela was a Xhosa from Transkei, but he came from an elite royal bloodline. Sisulu later said that he recognized Mandela's leadership potential that day, and convinced him to join the ANC. The two became good friends, with Sisulu lending Mandela tuition money to finish his degree. They then joined with another black activist, Oliver Tambo, to create the ANC Youth League in 1944. Their goal was to reenergize the ANC with an influx of young, politically articulate new members. In 1948, however, the racist Nationalist Party (NP) won South Africa's general elections. Drawn from South Africans of Dutch descent, the NP had come to power with a political platform that declared the superiority of the white race over all others. Once in power, the NP began putting into place stringent laws that enshrined apartheid, or racial "apartness" in the Afrikaans language, across the land. There were three classifications for people under apartheid: white, black, and colored or mixed-race. Under this system, which touched every part of daily life, everything was segregated based on these racial categories. In stores, whites were served first. If an ambulance was needed, the caller was required to give the race of the victim first, and lying about it was punishable by law. Hospitals and schools for blacks were dreadfully inadequate. Since Sisulu's father was white, he could have formally registered as a colored under the new law, thus protecting himself from the worst treatment. But Sisulu believed he had been raised entirely in black culture and refused to reject it. One of the most hated parts of apartheid were the "Pass Laws." These required any black who lived outside of the tribal homelands to carry an identification document if they wanted to work in an area like Johannesburg, which was the only place there were jobs. The passes were difficult to get, and a man who obtained one would not be able to bring his wife or children to live with him. A police officer could stop any black and ask to see his pass; not carrying it made a person subject to immediate deportation back to one of the homelands. The horrific situation energized the ANC, which elected Sisulu as Secretary General at its 1949 conference. He called for a series of strikes and boycotts to protest apartheid laws, and in 1952 devised a sweeping plan of civil disobedience. He called on blacks to openly disobey the government, with the aim of overcrowding the jails. Some 8,000 were arrested, including Sisulu several times, but South African authorities simply found new and more dreadful places to house detainees. ANC membership skyrocketed during the early 1950s, as the party became the dominant force resisting apartheid. In December of 1956, Sisulu and other senior ANC leaders were arrested under the Suppression of Communism Act. Their four-year-long treason trial attracted international attention and ended in acquittal. But the turning point in South African history came in March of 1960, when police opened fire on a demonstration of 20,000 blacks and killed 69; many of the dead were shot in the back. The South African government officially outlawed the ANC after what became known as the Sharpeville Massacre. In response, Sisulu and the ANC leaders created an adjunct group, Umkhonto We Sizwe (Spear of the Nation). This was the ANC's secret militant wing and carried out acts of sabotage. Sisulu served as its political advisor. He remained under constant watch by authorities, followed wherever he went and his home subject to surprise raids. Fortunately he had wed a staunch ally in the struggle, Albertina Totiwe, a former nurse, with whom he had eight children. She was also subject to "banning," a law that restricted a person from a social gathering of two or more people. Sisulu decided that he could better serve the movement by going underground, as Mandela had done. Sisulu disappeared for four months, but in July of 1963 police raided the secret ANC hideout in a farmhouse outside of Johannesburg. Sisulu and the others were arrested with incriminating documents. His trial--which included Mandela and several other ANC leaders--also gained international notoriety, and Sisulu delivered memorable, reasoned answers that likely helped save him and the others from the death penalty. The government prosecutors, for example, claimed that the ANC was misrepresenting black Africans, that the majority of them were happy with the situation. "Why doesn't the government put the matter to the test by having elections in which everyone could vote?," Sisulu asked in response, according to the Africa News Service. In the end, Sisulu and the others were sentenced to life imprisonment. They were housed on Robben Island, one of the world's most notorious prisons. Opened in 1961 to house black political prisoners, Robben Island was considered impossible to escape, for escape would have required swimming or rafting three miles through shark-infested Atlantic Ocean waters with deadly currents. Sisulu spent the years from 1964 to 1982 in this prison, with just two visitors allowed per year. His cell measured just seven feet square, and was lit all night. There was no bed, just a straw mat, and for a number of years he and the others, including Mandela, did hard labor by crushing gravel with hammers or quarrying lime. Their conditions improved late in their term, thanks to hunger strikes and international pressure, and they were allowed to read newspapers for the first time in 1980. Both Sisulu and Mandela were moved to Pollsmoor Prison in Cape Town in 1982. Meanwhile, Sisulu's children carried on the fight. His son Zwelakhe, a newspaper editor, was arrested in 1986, and his daughter Lindiwe was also detained and tortured. International pressure, including harsh sanctions against the South African economy, finally helped end apartheid in what was one of the most surprisingly bloodless handovers of power in world history. Sisulu was released on October 15, 1989, by recently elected South African president F.W. de Klerk, and the government did not even impose restrictions on the jubilant celebrations that took place in Soweto when he came home that evening. Mandela was released four months later, after 28 years in prison. By the time he was released much had changed in South African politics. Sisulu and other members of the ANC leadership helped usher in the era in which apartheid was dismantled and Mandela was elected president in historic 1994 elections, the first in South African history in which blacks were allowed to vote. Even during his 25 years in prison, Sisulu had believed change was possible in his lifetime, and knew that education and an end to propaganda were the keys to a freer society. "In my cell I was alone but guarded all the time by a [white] warder," he told Time writer Scott MacLeod not long after his release. "He would make comments and become very hostile when he saw certain things about the A.N.C. on TV. I then took a chance to talk to him, to educate him. In the end, he understood." Sisulu declined a position in the government, but continued to play an important role as an advisor to Mandela. Unlike other ANC leaders who moved into new homes once apartheid no longer restricted their residency, Sisulu and Albertina stayed in the same Orlando West home where he had lived in the 1930s. He died on May 5, 2003, at the age of 90. Thousands mourned him, and a state funeral was held at which Mandela eulogized him. "From the moment when we first met, he has been my friend, my brother, my keeper, my comrade," South Africa's first black president said of the man who had introduced him into the ANC. "The spear of the nation has fallen. Let us pick up the spear to build a country after the example that Walter Sisulu has set for us." Born Walter Max Ulyate Sisulu on May 18, 1912, in Qutubeni, Engcobo district, Transkei, South Africa; son of Victor Dickinson (a magistrate) and Alice Manse Sisulu (a laundress and domestic worker); died May 5, 2003, in Orlando West, South Africa; married Nontsikelelo Albertina Totiwe, 1944; eight children Education: Took night school courses in Johannesburg, South Africa to become a real estate agent. Politics: African National Congress. Worked as a dairy deliveryperson in Johannesburg, South Africa, c. 1928, and as live-in household help in East London, South Africa; also worked in a factory, a gold mine, and a bakery before opening a real estate office in Johannesburg; African National Congress, various roles, including treasurer of the Youth League, c. 1944, Secretary-General, 1949-55; African National Congress, special advisor to President Nelson Mandela. * (With George M. Houser and Herbert Shore) I Will Go Singing: Walter Sisulu Speaks of His Life and the Struggle for Freedom in South Africa, Robben Island Museum, 2001. View the full website biography of Walter Sisulu.